In fact, Jessica Dempsey, a co-discoverer and deputy director of the East Asian Observatory in Hawaii, said the fiery circle reminded her of the flaming Eye of Sauron from the ‘Lord of the Rings’ trilogy. Unlike smaller black holes that come from collapsed stars, supermassive black holes are mysterious in origin. Situated at the centre of most galaxies, including ours, they are so dense that nothing, not even light, can escape their gravitational pull. 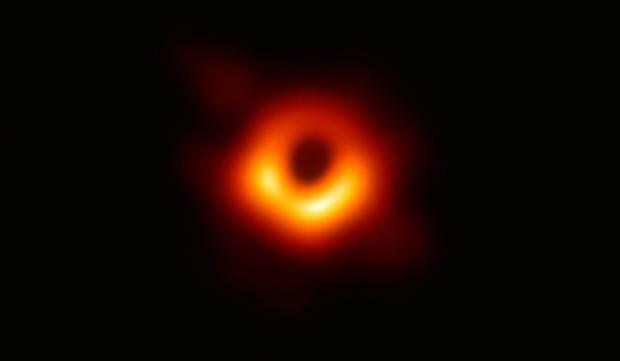 This one’s “event horizon” – the precipice, or point of no return, where light and matter begin to fall inexorably into the hole – is as big as our entire solar system. Three years ago, scientists using an extraordinarily sensitive observing system heard the sound of two much smaller black holes merging to create a gravitational wave, as Albert Einstein predicted. The new image, published in the ‘Astrophysical Journal Letters’ and announced around the world, adds light to that sound. Taken over four days when astronomers had “to have the perfect weather all across the world and literally all the stars had to align”, the image helps confirm Einstein’s general relativity theory, Ms Dempsey said. Einstein a century ago even predicted the symmetrical shape that scientists have just found, she said.